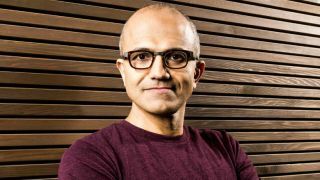 Microsoft has just announced that Satya Nadella will become the third CEO of Microsoft, succeeding Steve Ballmer and, of course, Bill Gates. The announcement was made on the official Microsoft website with a trendy Apple-style splash page. Nadella previously held the position of Executive Vice President of Microsoft's Cloud and Enterprise group and is a solid, if uninspiring appointment. "During this time of transformation, there is no better person to lead Microsoft than Satya Nadella," says Bill Gates. "Satya is a proven leader with hard-core engineering skills, business vision and the ability to bring people together. His vision for how technology will be used and experienced around the world is exactly what Microsoft needs as the company enters its next chapter of expanded product innovation and growth." Since joining the company in 1992, Nadella has spearheaded some major strategy and technical shifts across Microsoft's portfolio of products and services, most notably the company's move to the cloud and the development of one of the largest cloud infrastructures in the world to support Bing, Xbox, Office and other services. Many companies, Nadella says, "aspire to change the world. But very few have all the elements required: talent, resources and perseverance. Microsoft has proven that it has all three in abundance." Microsoft has also intriguingly announced that Bill Gates, previously Chairman of the Board of Directors, will assume a new role on the board as Founder and Technology Advisor, and will devote more time to the company, "supporting Nadella in shaping technology and product direction". John Thompson will assume the role of chairman. "Satya is clearly the best person to lead Microsoft, and he has the unanimous support of our Board," he said. "The Board took the thoughtful approach that our shareholders, customers, partners and employees expected and deserved." But who is Satya Nadella?